President Donald Trump’s campaign has kicked an “inexperienced volunteer” off the “road” after the staffer blocked a photojournalist from capturing images of a protester at a rally Thursday in Indiana. According to a statement shared by Olivier Knox, the president of the White House Correspondents Association, the Trump campaign does not condone the unnamed volunteer’s behavior. The response — “an inexperienced volunteer” — falls in step with Trump’s penchant for belittling the significance of aides or advisers who cross or publicly tarnish him, like campaign foreign policy adviser-turned “coffee boy” George Papadopoulos after he was indicted for lying to the FBI about contacts with Russia. 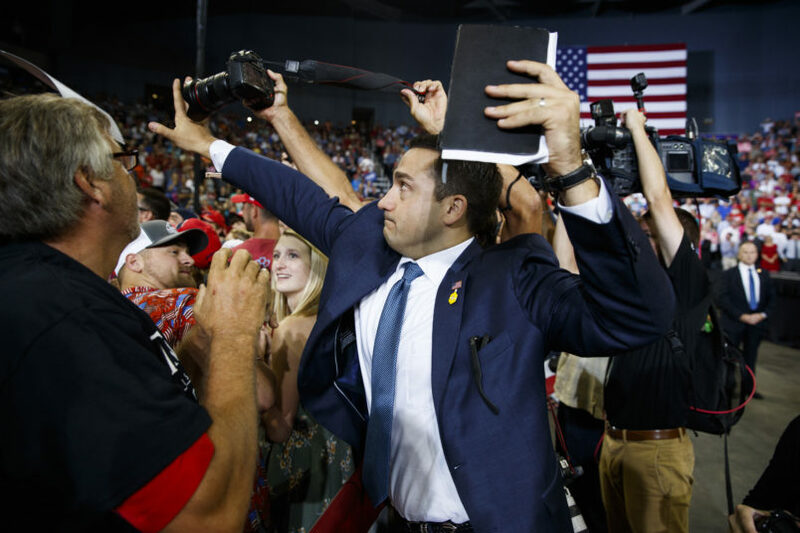 The incident was captured by Associated Press photographer Evan Vucci, whose photo shows the volunteer member of the advance team stretching his hand out to parry a photographer who was apparently trying to take a photo of a protester who disrupted the Trump campaign rally in Indiana on Thursday night. Trump reportedly paced on stage while the protester was taken out of the arena.